The White Honey Pink Collar is made from ribbon. Did Santa stick a little folding green in your pet’s Christmas Stocking? Let your fingers do the walking as you head on over to the Posh Puppy Boutique’s online store where you can find pet fashions … and more. Give your favorite four-legged little doggie diva a gift she will be passionate about: a Pink Candy Collar and Leash Set from Wooflink ($58). Designed for special occasions, and not made for strong pullers, this collar has a large bright bow and brass studs. The leash is pink with a pink chain. The collar also has small crystals embedded in the catch. Sizes range from extra small to large. Another very pretty collar is the White Honey Pink version ($30) from the Bow Wow Bows Collection. This ribbon collar features several bright bows over a grosgrain, 5/-inch ribbon. Sizes range from double extra small to extra large. Matching leads are also available. Our little silver glam dress is perfect for New Year's Eve or any other party. If you would like a contrast in colors, consider a pink collar with our Glam Dress in Silver ($28). This dress features a black bodice and silver mesh rosette skirt with metallic underlay. Sequins around the waist and neck add extra bling while the high-cut, stay-dry belly makes getting it on a snap. Sizes range from double extra small to medium only. Top off your pet’s outfit with her own Elegant Mink Coat in bright pink ($79). Made with faux (fake) fur, this coat has a designer laced collar and bottom with small flowers for that elegant and memorable look. Sizes range from extra small to large. Keep your favorite girl or boy dog warm this winter with our new Pocket Parka in Navy Blue ($50). It has a detachable faux fur hood, mock-neck sweater collar, fleece lining, Velcro ® closure and a removable pocket. Sizes—based on length, girth and neck measurements—range from double extra small to double extra large. If your pooch likes to play in the snow, and his or her version of fun is chasing critters, keep them warm with our Ultimate Camo Dog Coat ($39). Made with brown and green camo, it has a Velcro closure plus a lined and padded inside. Note that these coats tend to run toward the small size. Sizes range from extra small to Large. By the way ski and snowboard buffs, did you know that the Posh Puppy’s Retail Store is a short drive from U.S., which is the main route from the Bay Area to Truckee, the north shore of Lake Tahoe and Reno? Take 80 West (if coming from the snow, east if you’re heading to it), take the CA 65 exit and stay in the right. Take the first exit, which is Stanford Ranch Road and go east. Travel 1.8 miles and make a U-turn at Sunset Boulevard. The Posh Puppy will be on your right. Call 916-435-3044 with any questions and for holiday hours. Our Bark Jacobs dress is ideal for a special event like a New Year's party. Let your favorite female four-legged friend bark in the New Year in style with a new couture dress from the Posh Puppy Boutique. We have literally hundreds of dog dresses—and outfits for boys; too—to paw through. One example is our Bark Jacobs Tutu Dress ($74); which is festooned with rhinestones. This hand-made dress is made of teal with a black dot trim while the tutu is lined with black dot satin ribbon. A parfum bottle on the dress is line with Swarovski crystals and sparkles whenever your little girl moves. Sizes range from extra small to large. The Starry Night Dress is made for New Year's Eve. A perfect dog dress for a New Year’s party is our Starry Night model ($115). This evening dress has a gold metallic skirt flocked with black velvet stars then layered with a gold tulle petticoat. A black velvet bodice lined with black taffeta completes the dress while Velcro ® fasteners make getting it on a breeze. This dress comes in several sizes designed to fits dogs ranging in weight from 2-30 pounds; depending on neck; chest and body length measurements. If you are looking for something brighter to match your dog’s vibrant personality; consider our Couture Party Dress in Lime and Hot Pink ($180). This special occasion hand-made dress comes in one size only—medium. It features a bodice made of cotton with an abstract flower pattern of black; gray an lime roses. The skirt is made with several layers of lime green tulle while the collar has large silk lime roses; which also accents the drop-waist bodice. Pet owners not quite ready to let the holidays slip all the way away may prefer our red and green Designer Holiday Plaid Dress ($85) and similar Christmas Plaid Tuxedo Vest ($50) for the boys; both from designer Toni Mari. The sleeveless dress features a wide white collar with scallop edging and floral sequined body lined in satin. A satin ribbon at the waist with an oval rhinestone buckle completes it. Sizes range from extra small to double extra large based on chest measurements. Similar dresses are also available with a red ribbon at the waist ($85) or a green ribbon ($85). Sizes range from extra small to double extra large. The red and green plaid tuxedo lets your little boy compliment his exquisitely attired lady friend when they attend any holiday gathering. It features a side pocket with faux black hankie and bright red bowtie. Sizes range from extra small to double extra large. These and many more outfits for special occasions are available at the top stop for pet fashions; the Posh Puppy Boutique. The Posh Puppy Boutique sells these and thousands of other pet products both online and at our Rocklin, Calif. Retail Store. Call us at 888-837-5230 with any questions. Be sure to follow us on Facebook. The Original Lectro-Kennel comes with a fleece cover. “Mom and Dad, it’s cold outside!” Your pets may not be able to say that in so many words, but the odds are they are sure thinking it this time of year. Help your dog or cat start the 2013 by keeping warm with one of the specialty products or a warm sweater from the Posh Puppy Boutique. The Original Lectro-Kennel ($99-$154 depending on size) is designed with your pets in mind. Available in small, medium and large sizes, it is made of rugged ABS plastic with a steel-wrapped cord. The pad, which comes with a washable fleece cover, has an internal thermostat that keeps it at your pet’s internal temperature. This indoor-outdoor product is a perfect and economical way to warm dogs of any age, especially seniors, when you are at work. This bed has a hidden heater. Another similar option perfect for small dogs or cat is the Mini Heated Wellness Sleeper ™ Bed in Cranberry ($75). Looking just like a standard soft-sided bed, it has a built-in heating element providing low-level heat. It also has a detachable, chew-resistant cord. It also has a removable and washable cover. The size is 17.8 inches by 13.8 inches by 6 inches high. The Thermo-Kitty Sill also has a heater to keep your purry furry warm. Cat owners may find their favorite finicky feline prefers to be up away from the fray of frolicking dogs, but may still get cold. The Thermo-Kitty Sill ($78) is the answer. This oval platform has a dual heating thermostat inside soft orthopedic foam that keeps the surface 12-15 degrees above the local air temperature and up to 102 o F when your cat reclines on it. The sill can be attached to an existing window sill using the included Velcro ® fasteners or with screws. The Original Lectro-Kennel, the fashionable and functional Mini Heated Wellness Sleeper Bed and the Thermo-Kitty Sill are economical in that pet owners need only provide warmth directly to their dogs or cats, instead of heating the air throughout their homes. Another great way to keep your pet warm—and perfect for a last-minute holiday gift—is a new sweater. Our Furry and Sparkling Trims Sweater in red and white, normally $37, is on sale for only $19 while supplies last. Available in extra small only, it is hand-knit with white sparking fur trims. The Big Red Sweater ($60) is a cardigan made with a wool and acrylic blend. It also has an embroidered yellow daisy and red buttons. Sizes range from small to double extra large for the big boy and girl dogs out there. A perfect winter warmer is our Red Snowflake Hoodie ($40) with a classic white snowflake pattern on a red background. Size range from double extra small to extra large. These are only the tiniest sampling of our more than 500 sweaters that provide warmth and a great look for your pet. See more at the Posh Puppy Boutique. Our Christmas Angel Dress is made with black velvet and has a plaid taffeta skirt. 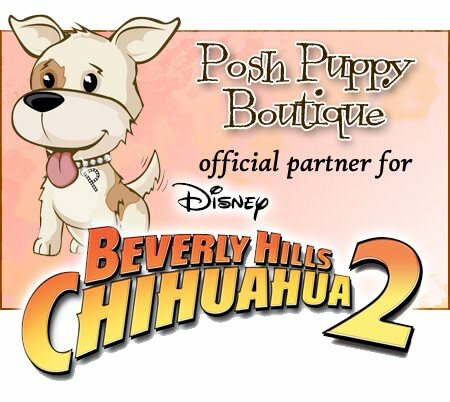 The Posh Puppy Boutique is known for its vast selection of quality pet clothes, especially those catering to well-heeled dogs. Our selection of top-of-the-line Christmas dog dresses is one integral part of who we are. One sterling example is our Christmas Angel Dress ($160), made from black velvet with a skirt bias cut in Christmas plaid taffeta. A layer of red tulle lines the skirt and glistens with flecks of metallic gold. The dress is topped with a big taffeta bow plus a “D” ring for easy lead attachment. Sizes—based on weight—range from 2-30 pounds. We also have several Christmas-themed tutu dresses. Our Christmas Couture Poinsettia Dress ($135) contains several layers of olive green tulle set on an olive green elastic crocheted tube. Topping the dress is a velvet flocked red Poinsettia with greenery accents. Sizes range from double extra small to extra large. The Christmas Couture Bubble Tutu Dress ($135) is similar to the Poinsettia dress above but features a red and green bubble pattern and red, white and green tulle. Sizes range from double extra small to extra large. The Christmas Couture Peppermint Candy Dress ($135) is all about red and white stripes and red and white tulle. Sizes range from double extra small to extra large. The Christmas Couture Candy Dress ($135) features a green tulle skirt, red and white bodice and red, white and green grosgrain bow on the back. Sizes range from double extra small to extra large. The Christmas Couture Peppermint Dress ($135) has a red and white tulle skirt, white bodice and red and white felt flower with green holly leaves. Sizes range from double extra small to extra large. All five of these dresses—visit our website to see a sixth—have a crocheted band to make them easy to take on and off. This coat is made by Oscar Newman. Make your dog’s Christmas dress special my embroidering the first letter of her name on it. Our Custom Jolly Holly Christmas Classic Top & Shirred Skirt Embroidered Dress ($105) from designer Toni Mari lets you embroider one letter on the back of this white stunner with a big red and white bow. Sizes rage from extra small to double extra large for the biggest breeds. Let your little girl greet Santa in our Little Santa Holiday Dress ($85). This red and white beaded number. Made with red satin and a tulle underlay, it has a full satin lining. This dress has a button chest, satin bow and round rhinestone buckle. It also comes with a “D” ring for easy lead attachment. Instead of a dress, consider an equally feminine I Love Santa Coat in red ($85). Featuring a white collar with “I Love Santa” embroidered on the white collar, this dress also has Swarovski crystals, double box pleats and hand-sewn iridescent sequins for a touch of Christmas shimmer. This coat comes to us from designer Oscar Newman. This blue Snowflake Sweater is designed for smaller dogs. Keep your favorite four-legged friend toasty and warm this winter with a new holiday sweater from the Posh Puppy Boutique. Made with a 70/30 mix of acrylic and wool, our Northern Reindeer Sweaters ($80) come in Red, Navy and Brown. Each sweater features a pattern with reindeer and pine trees. These sweaters also have a stretchable wait. Sizes range from small to extra large. Add some sparkle with our Snowflake Rhinestone Sweater ($75) in Navy, Red and Blue. Unique to these sweaters is a cubic snowflake button on the neck. The turtleneck collar can also be unfolded. Sizes range from extra small to large. Our Snowflake Snuggler comes in pink and blue. Our Snowflake Snugglers ($25) come in pink and blue. Lined with faux fur, each sweater features a metallic embroidered snowflake design, a leash hole and a high-cut, stay-dry belly. Sizes range from double extra small to large, depending on neck, chest and length measurements. The Christmas Star Dog Sweater ($25) also comes in blue and pink. It features knitted stripes and a decorative tree design. This sweater is also machine washable. Sizes range from double extra small to large, depending on neck, chest and length measurements. If turtlenecks are more your style of sweater, consider our Green Snowflake Sweater or our Pink Snowflake Sweater, $30 each. These Monkey Daze sweaters come in sizes from double extra small to large and feature a printed snowflake design. Our Christmas Star dog sweater. A different company makes our Blue and Red Knitted Snowflake Sweaters ($30 each). These festive dog-only products have a turtleneck collar and elasticized hem for a good fit. They also are machine washable. Sizes range from extra small to small only. Dogs of any size and breed might like our gray Caribou Creek Sweater ($30). Featuring a caribou (similar to a reindeer) and snowflake design, the stretchy, form-fitting turtleneck has ribbed sleeves and leg straps to keep your pooch warm even on cold winter nights. Sizes range from “teacup” to double extra large. If you want something with a touch of feminine flair, consider our Red Holiday Bows Pullover Sweater ($30). This fleece pullover is machine washable, Made in the USA and has four shiny brass-color buttons plus two large bows on the back. Sizes range from double extra small to large. These sweaters—and many more holiday-theme pet products—are available at the Posh Puppy Boutique. This T makes a great Christmas present for your dog. If your dog gives you lots of presents, in the form of kisses, reward them with a Present Holiday Tee ($22) or Christmas Gift Basket from the Posh Puppy Boutique. Made with 65 percent polyester and 35 percent cotton, the green short features a big red bow outlined in gold on the back. Sizes range from double extra small to extra large, handling the gamut from the smallest to largest breeds. We also have tons of great gifts for pet lovers and people who love—or at least like—pet lovers. The old standby is our gift certificates, which are available in any amount. Those people who want to go whole dog—we aren’t pigs around here!—consider making your own pet gift basket. Essential ingredients are an outfit, a grooming product, collar, toys and treats. Since we literally have more than 10,000 products to pick from, you can make your basket for the special “purrson” (we take care of cats, too) or pooch in your life. Here's another great gift idea. Our bright red Kiss Me Dog Tank Top ($30) has a drawing of mistletoe on it and is appropriate for dogs of all genders, ages and breeds in sizes from extra small to extra large. If you want something a bit more feminine, consider our red and white velvet Winter Wonderland Dress ($55). It has polka dots, white eyelet detail and a custom crystal candy cane applique. Sizes range from double extra small to extra large. A matching Winter Wonderland Vest ($55) for the boys is also available. Grooming products are always needed. After all, what smells worse than a wet, dirty dog? A wet, unbathed spouse? Maybe. Nootie has several dog shampoos such as Coconut Lime Verbena, Warm Vanilla Cookie and Cucumber Melon ($18 each). Each shampoo is free of soap, safe to use with topical flea and tick products and contains aloe and oatmeal to relieve dry, itchy skin. Add a spritz of fragrance and conditioner in each of these same fragrances—plus Japanese Cherry Blossom—($16 each) to your dog daily. Have your pet look ready for the holidays with our adjustable Peppermint Candies Dog Collar ($29). These 100 percent cotton collars are Made in the USA and machine washable. Sizes range from double extra small to large, depending on the circumference of your dog’s neck. If you want a collar that is even more glamorous, consider our Posh Pooch Candy Cane Swarovski Collar ($98) made with Swarovski ® crystals. This collar comes in sizes from being small enough for most to cats to large enough for the biggest breeds. Our Reindeer Nubby Belly Toys ($17) are among our most popular. These 7-inch plus toys have nubby bellies for added stimulation of your pet. No Christmas Day celebration is complete without a treat or two before bed. Top off your pet holiday gift basket with our Jumbo Christmas Bone ($26), which comes in its own gift box. This gigantic cookie measures 8 by 4 inches and is made with peanut butter dough then dipped in human grade nonpareil balls and coated with yogurt. These and many more great pet gift ideas are available at your number one choice for couture pet products, the Posh Puppy Boutique. Give your pet a gift you know they will like: a new toy. Give your dog a holiday gift they will love: a toy from the Posh Puppy Boutique. We have thousands to pick from, including many with Christmas holiday themes. For example, consider giving your favorite pooch a bright red 7-inch Santa ($8), complete with squeaker. We also sell a Long Body Santa Squeaker Mat Toy ($25) that is at least 10 inches long and has multiple squeakers, making it the perfect treat for bigger puppy buddies. Since Santa has elves, we also sell Elf Shoe Toys ($15) that come in red and green. These toys have crinkle paper and squeakers to keep your dog entertained. We also sell three long body squeak toys that are 13 inches long ($10 each) a Reindeer, a Santa and a Snowman. Send your little friend off to dreamland with a toy they can chew on or cuddle with: A 7-inch Dream Time Snuggler ($10), which is made of Berber and plush. Size your toy for your dog with our Green Santa Loofa ($10 or more). These toys come in lengths from 6-24 inches, allowing you to get one that is perfect for your pet. Other sizable Loofa Christmas toys, starting at $10 each, include the Santa Dog, Snowman and Red Dog Santa. Give your dog the thrill of ripping Santa apart, but with a design that lets you put him back together again, in our Pull-A-Part Santa Dog Toy ($10). This three-piece toy is designed to be pulled apart without destroying it, giving you pet long-lasting fun. If your dog is more of a chaser than a chewer, consider our 10-inch diameter Naughty & Nice Rope Flyer. Made with rope and nylon, it is perfect for throwing and tugging. For people with a pair of tuggers, consider our Naughty & Nice Tugs ($10). This 10-inch long toy has red and green cotton rope strung between two tennis balls making it perfect for one dog … and even better for two. Our Jolly Jump Rope Friends Dog Toys ($13 each) use a combination of soft plush and durable rope, making them great for chewing, tossing and tugging. These toys come in three styles: Penguin, Reindeer and Snowman. These and many more Holiday pet gifts are available at your #1 pet accessory store: the Posh Puppy Boutique. Is pooch a reindeer in disguise? Humans who sleep with their pets know that cats and dogs will cuddle where it’s warm. That means you can find them by your head, near your middle or below your feet. You can help keep your pets warm while spreading a little Christmas Cheer by topping their outfits with a holiday hat from the Posh Puppy Boutique. Our Reindeer Ears Hat ($30) comes in sizes from extra small (for small breeds and cats) to medium. Made with velvet, it uses an adjustable elastic to stay in place. Another version looks slightly different. The Christmas Snowman Hat ($30) comes in sizes from extra small (for small breeds and cats) to medium. Made with velvet, it uses an adjustable elastic to stay in place. Consider a red Christmas Santa Hat ($30) with a white “snowball” if you are looking for a more traditional design. comes in sizes from extra small (for small breeds and cats) to medium. Made with velvet, it uses an adjustable elastic to stay in place. Make a humorous takeoff on the traditional Santa Hat with this version ($30), which includes a fabric “beard.” comes in sizes from extra small (for small breeds and cats) to medium. Made with velvet, it uses an adjustable elastic to stay in place. Take a step up in style with our Knit Hat and Tube Scarf in Pink Swirl Strawberry ($80). This hat has two ear holes for your pet while the scarf is 27 inches long and has snowballs on both ends. This combination comes in small and medium. Our Elf Hat With Ears ($10) is perfect for the playful pooch, no matter how big or small they are. It comes in small, medium and large sizes. Sock chewers beware: The sock monkey hat is here. Some dogs like to play with socks. Put a sock on them in the form of our Crochet Sock Monkey Toboggan Hat in Red ($30) or pink. In sizes from extra small to large, this hat also has ear holes so your pet’s delicate flaps can listen to everyone laughing … including that jolly fat guy in the red suit. This is only a small sampling of the many hats and helmets—think “Born to Be Wild”—designed just for dogs and cats available now that the Posh Puppy Boutique. Call us at 888-837-5230 with any questions. The Posh Puppy Boutique sells these and thousands of other pet products both online and at our Rocklin, Calif. Retail Store. This Christmas Hat fits small dogs and many cats. While our name may make some people think the Posh Puppy Boutique only carries dog clothes and accessories, we also sell many products that fit cats. Some of them even have holiday themes. For example, this Christmas Hat ($37) uses an adjustable elastic to fit extra small to medium dogs and cats. Decorated with Christmas trees, Swarovski crystals and feathers, it’s purrfect for your smaller four-legged friends. Another holiday option is a green Santa Hat collar ($20), which features red and white Santa hats. It comes in sizes from extra small to large and a cat version, with a break-away buckle. If your cat likes their fish, consider getting them a “More Tuna for the Big Kathuna ©” Cat saucer ($21). Available in cream and light blue, it features real 18k gold letters. This saucer is not microwavable but it is dishwasher safe. Hide your cat's litter box in plain sight with this wooden cabinet. Add a piece of furniture you will encourage your cat to use: our Litter Box Cabinet ($325). It’s dark mahogany color and antique brass pull knobs let it fit any décor. Inside it holds a standard size open litter box plus a drawer for toys and a “pooper scooper.” It also has a side door letting your favorite feline enter and leave discretely. Keep your furry boy or girl—or both—warm and toasty with our Thermo-Kitty Cuddle-Up ($75). This 16-inch diameter bed with low walls incorporates a 4 watt heater in its design. It warms to your pet’s normal body temperature making great for cats and small dogs, especially senior citizens. We also sell the Thermo-Kitty Sill ($78) with a flat oval surface. It measures 14 by 24 inches and is designed to attach to a window sill. Give your kitty some treats in their stocking. Three great choices are our Devour for Cats ($10 for 2 ounces, $25 for 6 ounces) with human-grade freeze-dried chicken, and Pure Fish Salmon ($15) and Pure Meat Venison ($15), which are good for both cats and dogs. No pet stocking is complete without a toy or two. Our refillable 5-inch Crocheted Catnip Heart Toy ($12) comes in the shape of a heart with a long stem. The Candy Nips Toys ($6 each) are 8 inches long and filled with farm-fresh catnip. They come in many bright colors. Here at the Posh Puppy Boutique we also sell literally thousands of outfits and accessories designed for small dogs, many of which can also fit cats. Take a look at an outfit, measure your cat using our handy What’s My Size? Chart then apply the information. When in doubt, give us a call at 888-837-5230 with any questions. 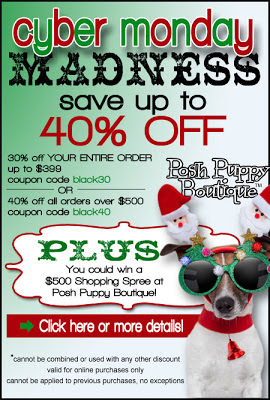 Have some money left over for biscuits when you shop the Posh Puppy Boutique’s Cyber Monday Madness Sale on Monday, Nov. 26 only. You can also register to win a $500 shopping spree simply by clicking here for details and complete contest rules. 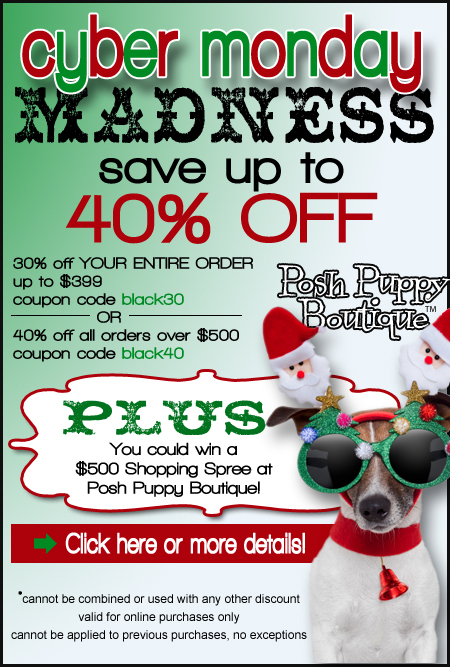 Everyone who shops the Posh Puppy’s Online store at www.poshpuppyboutique.com can save 30 percent on their order simply by entering the coupon code Black 30 at checkout. Your discount zooms up to 40 percent on orders of $500 or more. Our Cyber Monday Madness sale and contest end at midnight Pacific Time on Monday, Nov. 26. Our Round Holiday Pillow Dog Bed is comfortable and comes in many colors. Make your favorite canine comfy and happy with a bright red and white striped Round Holiday Pillow Dog Bed ($40). Available in small, medium and large sizes, this polyester and cotton bed features a removable and washable outer cover. Diameters range from 24 inches for the small to 43 inches for the large. Each bed has a 4-inch sidewall. These beds come in seven different colors including holiday stripes, Big Dots, Small Dots, Red, Suzani, Holly and Red Dog. Decorate your Christmas Tree with some of our many dog- and cat-themed decorations. For example, we sell several Jim Marvin ornaments such as this Cocker Spaniel with Pink Skirt ($25). Marvin is considered a leader in color and design directions. Other whimsical Marvin ornaments include a Dachshund in Hawaiian Shirt ($25), a Pomeranian with a Blue Bow ($25) and several equally cute breeds. In addition to dogs, Marvin also has several generic cat ornaments as well. Take a step up in price and elegance by decorating your tree with one of our Austrian Crystal rhinestone ornaments, which are made in the USA. Each ornament features a pet theme such as a Dog Bone ($40), red and white Dog House ($40) and Dog House With Holiday Tree. Our Austrian Crystal ornaments also come in outlines featuring the heads of several popular dog breeds. The Chihuahua ($40), for example, is 2.5 inches tall and has a red collar. Other breeds include the Greyhound ($55, 2.75 inches tall), German Shepherd($50, 4 inches tall), Beagle ($50, 2.5 inches tall), Westie ($40, 4 inches tall) and several others. Personalize your pet’s dog bone Christmas ornament in pink or red ($24 each). Each ornament includes your pet’s name and one more line of text. The ornaments are made from acrylic mirror so they will not shatter if accidentally dropped. Get your pet their own stocking that you can fill with toys and treats. Our Bone Stocking with Cuff ($65) is 20 inches long and comes in red or green. They are handcrafted with intricate edging and exquisite detail. We always post our latest sales news on our Facebook page, so be sure to Friend us. Call us at 888-837-5230 with any questions. Your pockets may jingle with the savings left after our Black Friday sale. Posh Puppy Boutique online customers can have some coins jingling all the way to the bank if they visits us on Black Friday. Everyone saves a whopping 30 percent on purchases made on Black Friday (Nov. 23). Just enter the coupon code black30 at checkout. Customers who spend more than $500 that day will save a Santa-licious 40 percent by entering the coupon code black40 at checkout. One great way to show your style and sophistication is by letting your favorite little girl show her stuff in our Christmas Couture Snowflake Rhinestone Dress ($315). This handmade dress features Austrian crystals. Sizes range from triple extra small (teacup) to medium. If you are looking for classy, couture Christmas ideas for your favorite four-legged friend, consider one of our eight Couture Jeweled Victorian Christmas Leashes ($140 each). Made with bigger girl dogs up to 40 pounds in mind, these leashes use a combination of glass beads, Swarovski crystals, rhinestones and stainless steel curb chains plus a large clip. These Victorian leashes add style and elegance to daily walks. · Rose and Crystals, made with satin finish rose glass pearls and finished with a woven ivory satin ribbon handle and clip. · Pearls and Crystals, made with Swarovski pearls in ivory, deep red and dark green. This version has “Merry Christmas” spelled out on the handle. · Ice Blue/Snowflakes features icy blue and night blue Swarovski pearls plus Swarovski crystals and snowflakes. · Maroon/Powder Green features maroon and powder green Swarovski pearls, clear Swarovski crystals and filigreed bead caps topped with a woven ivory satin handle and clip attachment. · Pink Pearl Crystals has pink Swarovski pearls, rhinestones and “Merry Christmas” in gold glitter on the handle. · Cold Outside features Swarovski pearls and clear Swarovski crystals plus rhinestones and snowflake bead caps. The blue handled is adorned with white snowflakes. · Red/Deep Green includes Swarovski crystals in two of the most common Christmas colors plus rhinestones and a deep red velvet ribbon handle. · Festive Green/Red is made with glass pearls in dark green and red with antiqued bead caps, rhinestones and Swarovski crystals. Even boy dogs will enjoy getting dressed up for the holidays in our new Rudolph the Red Nosed Reindeer Harness Vest ($210) or The Winter Wonderland Harness Vest ($210). Both feature Christmas icons hand crocheted in Egyptian cotton set on a micro suede landscape with Swarovski crystal elements. Sizes range from extra small to large. When you are done shopping for family and friends, get on Santa’s good side: pick up a bunch of our Holiday pet toys and donate them to local animal shelters. Maybe you can even give a shelter dog or cat the gift that keeps on giving: a new home. These and thousands of other dog and cat gifts are available at your holiday pet headquarters, the Posh Puppy Boutique. We always post our latest sales news on our Facebook page, so be sureto Friend us. Call us at 888-837-5230 with any questions. Your pooch will be a huge hit with our holiday bandannas. Get your favorite fur baby dressed for the holidays with great looking products from the Posh Puppy Boutique. Among our newest holiday-themed arrivals are two Christmas bandannas designed to fit every dog, large or small. Our Holiday Ty Monkey Business Dog Bandana ($10) features a the face of a monkey wearing a holiday hat, all on a green background. Our Holiday Tif Monkey Business Dog Bandana ($10) features a girl monkey with a green hairbow on a red background. Stay in the monkey mood at night by dressing your little buddy in our red Silly Monkey Fleece Hooded Pajamas ($35). This outfit looks cute every night and morning while keeping your dog cozy and warm. Sizes range from extra small to extra large. For a more feminine touch in dog night wear, take a look at our pink Peace And Cupcake Turtleneck Fleece Pajama ($35). This outfit has extended sleeves that can be left down for some dogs, or folded up for others. Sizes range from extra small to extra large. Be ready for those cold winter nights by dressing your little angel in our Snowflake Fleece Hoodie with Angel Wing ($35). This holiday red outfit trimmed in white has angel wings on the back. A “D” ring sits in the middle of the back, moving the stress of a leash away from your dog’s delicate neck bones. Sizes range from extra small to extra large. Keep your pooch’s head and/or neck toasty and fashionable, too, with any of several handmade knit hats designed just for dogs. We sell several handmade knit dog caps. For example, we have this Hot Pink snowcap model ($35) that features ear holes and two straps to keep it securely on your pup. It comes in small and medium sizes based on head size. The bright pink hat is topped with a big white snowball. For something more festive, check out this Candy Cane Knit Hat ($35) that is purrfect for the holidays. It comes in sizes from extra small (for puppies and some cats) to medium. The design features red and white diagonal stripes plus earholes and a pair of straps. Consider something different in terms of color: our Purple and White Knit Hat ($35). It comes in small and medium sizes based on head size. Deck your pooch out with our Knit Hat and Scarf combo ($80). Made with red, white and pink yarn, the hat features a bright white snowball on top. The scarf is 30 inches long and 2.5 inches wide, adding style and comfort to their holiday outfit. 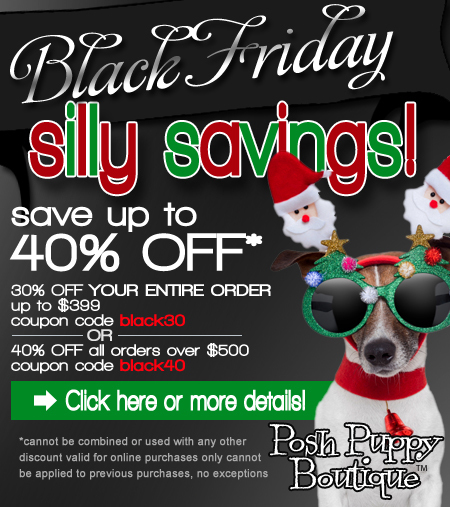 Don’t forget to check our website at www.poshpuppyboutique.com for some great Black Friday, Small Business Saturday and Cyber Monday deals. Swing by our retail store in Rocklin if you are in the Sacramento, Cal. area and check out many of these products in person. Well-behaved dogs are always welcome. Call us at 888-837-5230 with any questions. 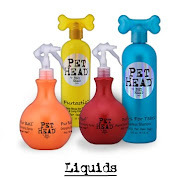 The Posh Puppy Boutique sells these and many other pet products online and at our Rocklin, Calif. Retail Store. Let your dog help celebrate Hanukkah with a special sweater. Are you uncertain what to get the fashion-conscious pet this holiday season? Consider pawing through the 10,000-plus items in the Posh Puppy Boutique online catalog. Our Jewish friends can have their pup celebrate Hanukkah, by dressing them in our Hanukkah Pup Sweater ($38). This crystal blue sweater has reinforced armholes that make it comfortable and durable for dogs in sizes from double extra small (up to 3 pounds) to double extra large (up to 33 pounds). The sweater’s back features an embroidered Star of David in metallic silver. Let your dog (or cat) look the part by topping them with a Hanukkah Hat ($37). The crystal blue hat is decorated with a Star of David and has two “curls” hanging from it. An adjustable elastic keeps it safe and secure. Keep your pup cozy and warm during the cold winter nights by covering them with our Star of David Rhinestone Coat ($45). Available in red, black and pink, this hooded coat has a lined collar for comfort and style. It comes in sizes from extra small to triple extra large. Woof, woof, woof, it's Santa Dog! Your pooch is sure to be the hit of every Christmas party when you outfit them in our Santa Dog Costume ($20), complete with four leg cuffs for added style and panache. The costume has a combination red hat and white beard, which slip on and off easily. The cuffs have bells that jingle when your dog walks or prances around the neighborhood. Sizes range from tiny to large. Is someone in your household bringing a pet home for the holiday? Make your gift extra special by dressing them in a Present Holiday Tee ($22). This shirt’s design features a contrasting bow on the back. It comes in red (double extra small and extra small only) and green (double extra small to large sizes are available). A great gift for girl dogs is our bright pink Deck the Halls Sweater ($25) featuring a snow woman, Christmas tree and gifts. It has a ribbed neck with scarf detailing, leg straps and a high-cut belly. Sizes range from double extra small to large. Reward your pooch with our Puppy’s First Christmas Tank ($25), which is white with red and green accents. It comes in extra small only. Our Blizzard Buddies Sweater ($25) makes a great holiday gift. The blue background is highlighted with falling snowflakes and several small penguins falling to a large patch of snow. The pullover sweater has a turtleneck collar and ribbed hem plus a stay-dry belly. Sizes range from double extra small to large. These dog clothing items plus numerous holiday-themed accessories, apparel, collars, harnesses and leads, pet-themed decorations for your holiday home, toys and treats can all be found at one spot: the Posh Puppy Boutique.